This well-appointed and tastefully decorated condo is located only feet from the slopes of Sunlight Mountain Resort! Step right off the main deck and you're on your way to great skiing or hiking. 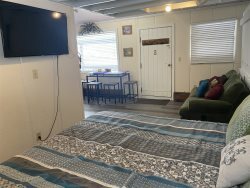 E9 is right next to the recreation room and shares the same deck as our community charcoal grills and outdoor hot tub. This condo is the perfect mountain lodging for families or a couple looking for a romantic get-away.